FRANCES JOY HAITHCOCK PEARCE, 89, died peacefully in Clarksville, Indiana on Sunday December 2, 2018. The body has been cremated with the Oak Street Chapel of Naville & Seabrook Funeral Homes in charge of arrangements. 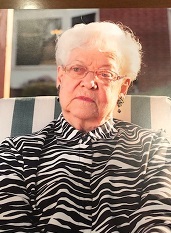 A Memorial Service celebrating Frances' life will he held at 3:00 PM Saturday December 15, 2018 at Westminster Village(2200 Greentree N.: Clarksville, IN. 47129). Her ashes will be spread by her nieces and nephews at locations meaningful to Frances and to them. Born in Gossburg, Tennessee, on February 2, 1929, she was the daughter of the late Claude and Carrie Kathleen Messick Haithcock. Growing up on a rural farm in Tennessee, she, her sister and brothers were close to grandparents, cousins and kin. They all told stories of playing in the creek, making mud pies, visiting family on lazy Sunday afternoons and riding to school each day to attend the Webb School in Bell Buckle, Tennessee. In the early 1940’s the family relocated to a farm near Palmyra, Indiana. In 1946, she married Joe Alie Pearce and they made their home on a dairy farm near Greenville, Indiana, until his death in 1993. She retired from the H.A. Seinsheimer Company in New Albany, Indiana. Frances was always giving her time and talents to the benefit of others. She was a founding member of the Greenville(Indiana) Optimist Club. A lifelong member of the Greenville(Indiana) Christian Church, she was the nursery class teacher for many, many years. She was an accomplished organist for her church although she played her beautiful music mostly by ear. It was through her church she became known as “Granny Frances” to hundreds of young children who admired her and learned their Sunday School lessons by her guiding hand. These special and loving bonds continued on and on as her Sunday School children grew into adults, marrying and having children of their own that were taught about this special lady. Quietly and without fanfare, she often provided needed things for children and young people, funds for their college education and even sewed many costumes for plays and performances throughout the area. Frances loved to travel in the United States and abroad, meet interesting and new people as she traveled the globe. Upon moving to Westminster Village in Clarksville, Indiana, over 20 years ago, she poured her unparalleled volunteerism into everyday activities of the facility. Organizing quilting bees to make beautiful quilts for any fundraising occasion, ringing the bell for BUNKO, setting up for the weekly vespers service or watering plants, she was always a willing worker. In 2006 she was recognized by the Residential Foundation Housing as their Volunteer of the Year and traveled to California to receive the recognition. In recent months her health declined but her spirit and desire to help others never waned. Many of her fellow residents have expressed they don’t know what they will do without Frances. Frances died leaving behind her adoring nephews Miles, Keith and George Haithcock, and nieces, Cathy Welborn Wallace and Carrie Joy Welborn Brookshire who are all heartbroken at the loss of their loving aunt.